This is Max, he is a 9 year old Golden Retriever from Salt Spring Island, BC. 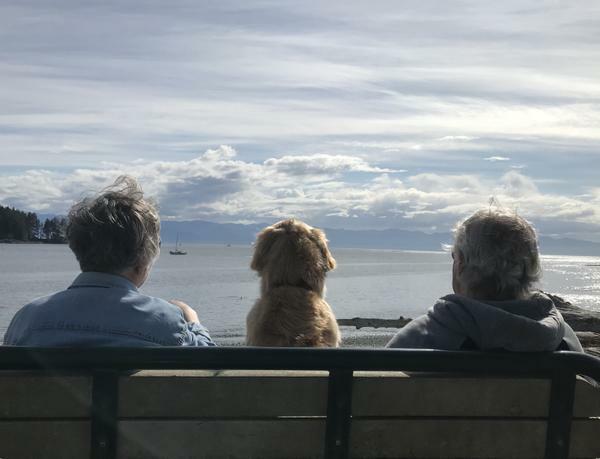 He was adopted, via Kijiji, just a few weeks ago by this nice couple because his original owner had medical problems and couldn’t look after Max anymore. He looks pretty at home, doesn’t he? They didn’t have their phones with them, so I took it with mine and then sent it to them. They were so grateful. Then they told me their story, it turns out this was their first ‘family’ picture together! I recognize that what I did may seem a little unconventional, but it’s actually something I do quite often. I think at first it embarrassed The Hub (he’s just used to it now) and sees how happy it makes other people. For the record, no one has ever said no to me asking to take their picture for them, they have all been grateful. The situation almost always happens when I am behind a person or persons, when I see something in the foreground that moves me, with a background that is lovely. For example, a couple holding hands walking in the woods. It’s a view of people that they can’t see themselves. It’s a picture they could not take. It’s an un-staged photo. It’s real life, captured. It’s not just about photos though. We can all see things in others that they can’t see themselves – as they can do for us. We can give people a fresh perspective – as they can do for us. We can highlight their beauty and gifts in a way that maybe they didn’t know was apparent. I know every time I do this for someone, they seem to feel good and I feel great! And all it takes is a little awareness and a little courage! Sharing your perspective, it’s just one more way to live Your Life, Unlimited! This entry was posted in Happiness, Newsletters, Relationships, Wellness and tagged e-news, family, happiness, relationships, Stephanie Staples, Your Life Unlimited. Bookmark the permalink.